Friday evening, I got home at about 5:30 and i knew I wanted to run. I’d run on Thursday, a slow 2.5 miles at sunset because I hadn’t gotten a chance to run all week. It was hot and I was tired and I wasn’t prepped, but i went out and got it in. So Friday evening, I wanted to keep it going and run again. Earlier in the day, my friend, Tara had asked me how often I run and I didn’t know quite how to answer her. The truth is that my schedule for the past 3 weeks or so hadn’t allowed for regular runs – I catch a mile here or there, sometimes i record it, sometimes I don’t. But to be a running-blogger, I’ve been really lacking on the miles. But I want to get back to what I do. 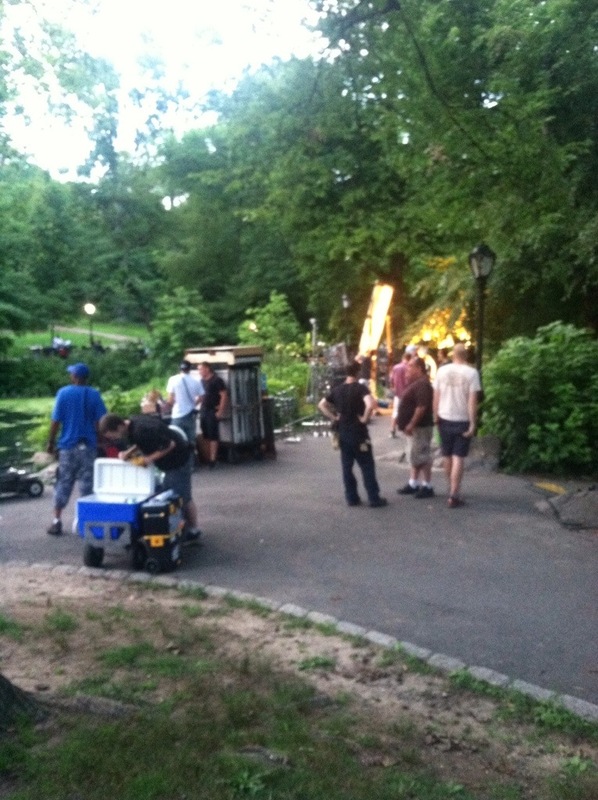 There was a movie being filmed in Central Park, evidenced by these long trailers that were parked on the running path and this crew that had taken over the area by the duck pond. 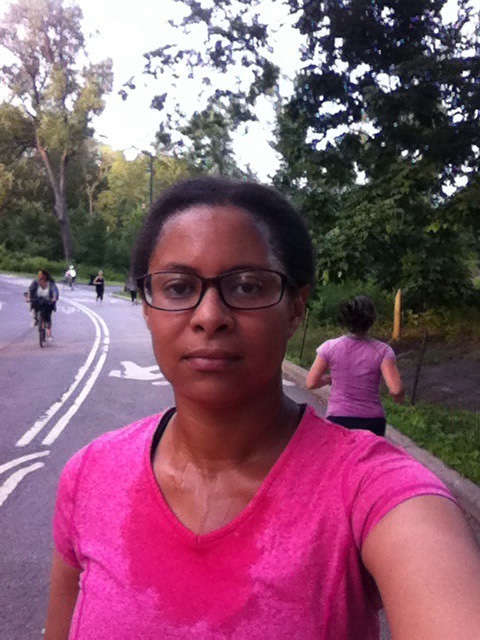 I ran to Whole Foods on Columbus Avenue – a 5K distance and I was concerned about how much I was sweating. I mean the sweat was falling out of my pores like I was taking a shower. Evidence below. Is it normal to be so sweaty after just about 2 miles when I took the photo? I felt like I wasn’t really getting into the run, like my body wasn’t being efficient. So I stopped to cool down and bought some chocolate and some fruit. About 20 minutes later, I was out and walking home. And I felt like I had gotten a second wind – like I had enough energy to run again. So I did. Thankfully, I had only bought a couple things that fit in a small paper sack, no shopping bag required. So I started running, and I got another 2.33 miles. Not a bad afternoon – 2 runs for a total of 5.5 miles on a afternoon where I felt like I couldn’t really get into it. Proof that If you push through the mental, you can always achieve the physical. I have great plans for next week. I plan to Eat Right, Live Right and RUNWRIGHT. Next Post Does Having Fun With Friends Count As Cross Training? I feel like this summer has been a total sweatfest! It seems like it’s humid every single day!! It’s really not that bad in NYC… Yet. But August can get really muggy here. I am already planning to spend August afternoons in the pool.